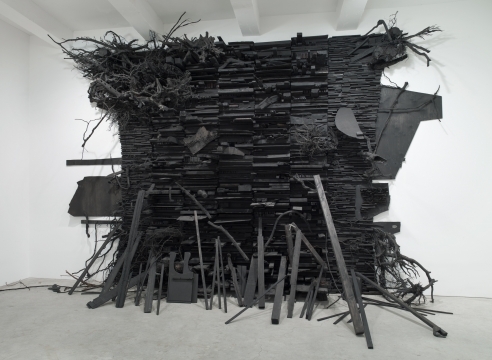 Galerie Lelong & Co. is pleased to present Brooklyn-based artist Leonardo Drew’s first solo exhibition with the gallery. For the past 30 years, Drew has transformed varied new materials into expressive assemblage, often distressing raw ingredients to evoke the passage of time. With this exhibition, Drew expands his practice to incorporate a wider spectrum of color and to explore new aspects of his materials. The main gallery features Number 215 (2019), an energetic wood installation that is both sweeping in scale and intimate in detail, creating the appearance of an enveloping explosion that is frozen in time and space. The exhibition coincides with Drew’s first major outdoor public artwork, City in the Grass, an over one-hundred feet long by thirty-feet wide project commissioned by Madison Square Park Conservancy, New York. City in the Grass will be on view from June 3, 2019, through December 15, 2019. An undulating aluminum substructure serves as the base for the artist’s use of colored sand — a new and unexpected material — and wood reliefs that evoke the designs of a patterned carpet. While City in the Grass responds to the Park’s urban terrain, Number 215 becomes an otherworldly viewer experience. Drew was born in 1961 in Tallahassee, Florida, and currently lives and works in Brooklyn, New York. Drew’s work is on view through May 19 in Solidary & Solitary: The Joyner/Giuffrida Collection at the Smart Museum of Art, Chicago. His works have been shown internationally and are held in numerous public collections including the Metropolitan Museum of Art, New York; Solomon R. Guggenheim Museum, New York; The Museum of Contemporary Art, Los Angeles; The Hirshhorn Museum and Sculpture Garden, Washington, D.C.; and Tate, London. Recent solo museum exhibitions include shows at the SCAD Museum of Art, Savannah (2013); Beeler Gallery at the Columbus College of Art & Design (2013); Palazzo Delle Papesse, Centro Arte Contemporanea, Siena, Italy (2006); and the Hirshhorn Museum and Sculpture Garden, Washington, D.C. (2000). Drew’s mid-career survey, Existed, premiered at the Blaffer Gallery at the University of Houston in 2009, and traveled to the Weatherspoon Art Museum in Greensboro, North Carolina, and the DeCordova Sculpture Park and Museum in Lincoln, Massachusetts.